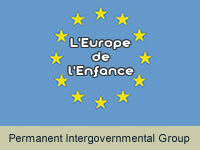 L'Europe de l'Enfance is a Permanent Intergovernmental Group established in 2000. It aims to introduce the mainstreaming of children's policies and the rights of the child in all EU policies. L'Europe de l'Enfance was created in order to exchange knowledge and promote a comparison of the condition of children and adolescents and of the related policies followed at national level, given the fact that these issues do not fall under EU competence. L'Europe de l'Enfance is composed of National Ministries or other Government representatives in charge of childhood policies in the EU countries. They meet once per semester on the invitation of the country holding the EU Presidency. Since its establishment, the Group has chosen one or more specific themes to focus on in every meeting. For more detailed information please see the L'Europe de l'Enfance terms of reference (95 Kb ). L'Europe de l'Enfance is part of the European Forum on the Rights of the Child.